The Boston Globe had an interesting article last Thursday about the boarded-up buildings in Brighton that were once part of the Charles River Speedway. The speedway was an old race track that once lined the banks of the Charles River west of North Harvard Street and north of Western Avenue. 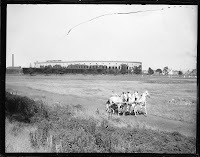 Some of my favorite vintage photographs in the collection of the Boston Public Library are of the chariot races that were once held at the Speedway, which were perhaps fitting given that the Romanesque structure of Harvard Stadium was adjacent to the track and provided an appropriate background. 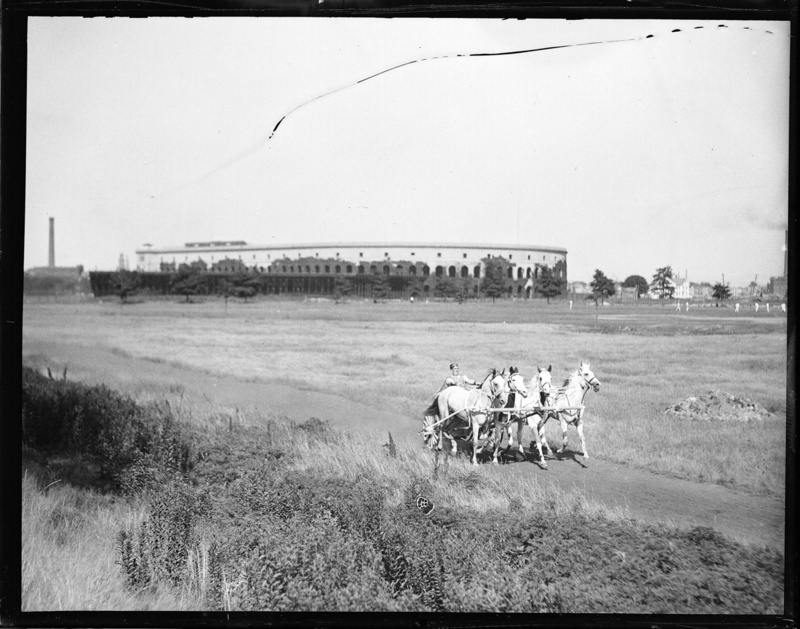 The Charles River Speedway is gone, but the former stables and headquarters still stand on Western Avenue near the interchange with Soldiers Field Road. Last week Preservation Massachusetts included the track's six standing structures to its annual list of the state's Most Endangered Historical Resources, and hopefully they can preserved and put to use in some capacity. The remnants of the Charles River Speedway are relics of a bygone time in the late 1800s and early 1900s when horse and harness (and later bicycle, motorbike, and automobile) racing were popular pastimes in Boston, and numerous racetracks dotted the landscape around the city. During the Victorian era, Boston Brahmins, whose bloodlines could be just as blue as those of champion steeds, enjoyed racing their equines. Racing enthusiasts formed driving clubs and trotting associations all throughout metropolitan Boston, and a host of tracks sprung up where competitors could race horse-drawn vehicles such as buggies, runabouts, and surreys. Crowds as large as 15,000 would fill the grandstands and line the rails of these tracks to watch field days, interclub races, and national championships. One of the more popular tracks in the city was Beacon Park in Allston, which opened in 1864. The track was also used by Buffalo Bill to stage his Wild West Show when it came to town, and he quartered his buffalo and horses between performances in the nearby Brighton Stockyards. The owners of Beacon Park—Eben Jordan and Charles Marsh of Jordan Marsh fame—sold the land in the 1890s to the Boston & Albany Railroad for conversion to a rail yard that still exists on the site along the Mass Pike. By the end of the 1800s, harness racing was among the most popular sports in the city and the country, and one of America’s premier tracks—the Readville Trotting Park—opened in the Hyde Park section of Boston in 1896. The oval at the foot of the Blue Hills and along the banks of the Neponset River was one of the most significant harness tracks in the history of the sport, drawing the country’s best owners, trainers, drivers, and horses, including the legendary Dan Patch. An historical marker unveiled in 2007 commemorating Readville Trotting Park is located at the intersection of Neponset Valley Parkway and Meadow Road. A chain-link fence at the end of Hyde Park Avenue marks the old entrance to the track, which was once graced by a magnificent gate replete with Corinthian columns. The Dorchester Gentlemen’s Driving Club held field days at Readville until a racing oval was built in 1904 at Franklin Field, just off Blue Hill and Talbot Avenues. Two of Boston’s legendary politicians and mayors—James Michael Curley and John F. “Honey Fitz” Fitzgerald, grandfather to John F. Kennedy—even participated in trotting races at Franklin Field Speedway. Even The Country Club in Brookline, best known for hosting the U.S. Open golf tournament, has its roots in horse racing. The club was formed when a group of Boston’s most prominent gentlemen leased Clyde Park, a 100-acre horse farm with a half-mile racetrack and a farmhouse once owned by Daniel Webster. Other tracks around Boston included the South End Park, Old Cambridge Park in Cambridge, and Mystic Park in South Medford. More about Boston's horse racing heritage can be found in The Die-Hard Sports Fan's Guide to Boston.